The Iraq veteran must prove his anti-war — and liberal — credentials. 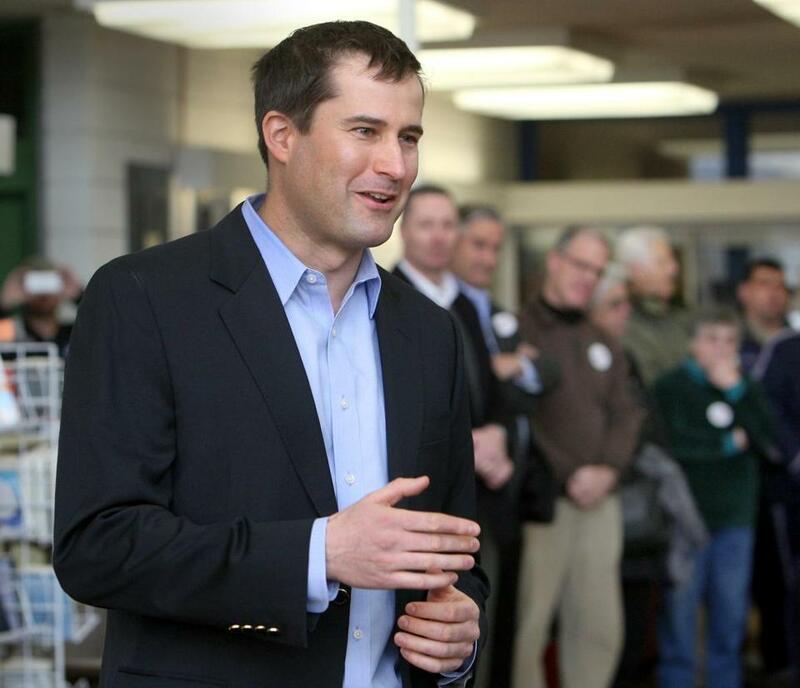 Congressional candidate Seth Moulton attends a Democratic caucus at Salem High School in March. When President Obama recently authorized humanitarian aid and air strikes in northern Iraq, Seth Moulton, a war veteran and Democratic candidate for Congress, quickly put out word on where he stood. Humanitarian assistance is fine — but the United States should not send ground troops back to Iraq. Moulton also opposes sending to Iraq military advisers, his very own role in the country a decade ago. If, as Moulton is, you’re running for office in liberal Massachusetts, and especially if you are running against John Tierney, an incumbent who voted against invading Iraq in 2003, you walk a careful line on matters of war and peace. Saber-rattling is not a winning strategy, even in the state’s more conservative Sixth District. Elsewhere in the country, Moulton’s combat credentials would be a blue-chip asset. Here in Massachusetts, respect for his veteran status runs up against disrespect for an unpopular war foisted on a country under false pretenses. From the Tierney camp, it’s also cause for skepticism about Moulton’s true ideology, as if a military background automatically disqualifies a candidate as a liberal. She did not have the final word. At Harvard, Moulton was mentored by the late Peter J. Gomes, a theologian and professor of christian morals, who spoke to him about service to country. Their discussions led to Moulton’s decision to enlist in May 2001, right before his Harvard graduation and four months before the Sept. 11 terrorist attacks. According to his campaign website, Moulton led an infantry platoon during the 2003 invasion and was in the first Marine company to enter Baghdad. He went on to serve four tours of duty and work as a special assistant to then-Lieutenant General David Petraeus. After his final tour, he returned to Harvard, where he earned an MPA from the John F. Kennedy School of Government and an MBA from Harvard Business School. Tierney, 62, was first elected in 1996. Even with four Democrats challenging him, he appears in no danger of losing the primary. Yet, with Iraq back in the headlines, Moulton’s military record offers an interesting contrast to Tierney’s staunch, anti-war voting record. The Tierney camp likes to point out that when Tierney voted against the Iraq invasion, his constituents favored the military campaign, and the newspapers in his district backed it up on their editorial pages. But now, as public opinion on that war effort has shifted everywhere, Moulton is the one who has to distance himself from Iraq. He said he was proud to serve but calls the war a mistake. But Moulton did not vote for war. He just served in it.